Where design meets functionality; this Faux Wood blind features a unique embossed wood grain texture that gives the appearance of real wood. While these blinds offer a classic look that will complement any dicor, the slats are made form heat and moisture resistant material, making the blinds ideal for bathrooms, kitchens and garages. The slats will not warp or crack, and provide privacy when closed. Dont forget the energy saving value it can add to your home by providing additional insulation to your windows. 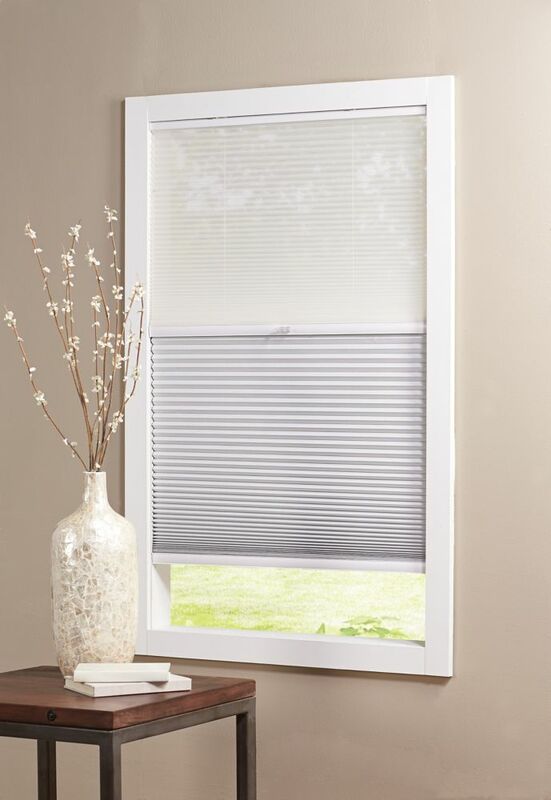 Cordless Day/Night Cellular Shade Sheer/Shadow White 48-inch x 48-inch (Actual width 47.625-inch) The right window shade can refresh your room with light and colour. When making your choices, be sure to think about how much light you need. A sheer cellular shade will filter light gently into your space, while a black out cellular shade will stop unwanted brightness. You'll also want to consider tone and texture. What shade will complement your furniture, floor coverings and wall colour? Cordless Day/Night Cellular Shade Sheer/Shadow White 48-inch x 48-inch (Actual width 47.625-inch) is rated 4.0 out of 5 by 1. Rated 4 out of 5 by nicjon from Beautiful Shades The shades are beautiful and they work perfectly. Quality is very good. Only draw back would be cleaning them. We have a wood stove and it’s very difficult to get them clean. Cleaning is limited to dusting them as you are not suppose to submerse them in water. In hindsight a more expensive blind that you could wash (like a Hunter Douglas) would have been better but at triple the price. I still recommend them but I wouldn’t recommmed them for anyone with a wood stove. My window is 45.25 X 39.25, can these be cut in store to fit my window? And if so, is there an additional charge for this service? There is no additional charge for cutting in store. My window is 45 1/4 X 36 7/8. I also want to know if these can be cut to fit.